Last winter I asked someone from the Target Center when they were going to complete the improvements to the seasoned arena. I got a snicker and a laugh from that person. I guess this is the reason that they were laughing. The reason this story is relevant is that the NCHC has their conference tourney in the Target Center. A $129 million renovation of downtown Minneapolis' Target Center is slated to begin later than previously expected, spanning from summer 2016 through summer 2017. Celebrating the 25th anniversary of the city-owned arena on Tuesday morning, Timberwolves officials said the project will require the Minnesota Lynx to relocate to another facility in summer 2017. As late as March, Timberwolves officials still hoped to begin the project in 2015 and complete it by fall 2016. Tuesday's announcement was intended to represent the first concrete timeline of construction, however. They also announced that a longstanding naming rights agreement with Target -- one of the first for a professional sports arena -- will be extended. Target and Timberwolves officials declined to release the terms or length of the agreement at a press conference Tuesday. The renovation project will begin with a new scoreboard and acoustic improvements next summer. In late 2016, work will begin transforming the building's concrete exterior into a more glassy, inviting façade. Other changes include larger loading docks, improved public spaces and restrooms, and more club suites. While they're working on the Target Center, they might want to improve the ice conditions and the class and boards surrounding the ice. Time to reserve those seats for next year's Frozen Faceoff. I also recommend the Minneapolis Marriott City Center.I stayed there last March and it was an amazing hotel. The NCHC Conference Composite Schedule can be found here. 21 home games this season and 15 away games this season. GRAND FORKS, N.D. – A select number of Inaugural NCHC Frozen Faceoff tournament ticket packages will go on sale to members of the North Dakota Champions Club and the general public today. Champions Club members have until 5 p.m. CT today to make their requests by e-mail. If there are any ticket packages still remaining after fulfilling the Champions Club requests, general public requests will then be granted. Requests should be e-mailed to tickets@theralph.com. E-mail requests should have the words “NCHC Tickets” in the subject line, and Champions Club members should include the number of tickets requested in the body of the e-mail. Priority for ticket purchasing is based on Champions Club Priority Points as of March 1, 2014. General public requests need only to include the number of tickets requested and a phone contact. All e-mails will receive a confirmation. Inaugural NCHC Tournament ticket packages cost $130 and are good for all four games in the tournament. The UND Box Office does not sell single-game tickets. For more tournament ticket info, visit NCHCHockey.com. UND Fans attending the NCHC Tournament are invited to join the UND Alumni Association & Foundation and UND Athletics for pregame festivities beginning three hours prior to any game that UND is playing. The pregame events will be held at the Pourhouse (10 South 5th Street, Minneapolis, MN), within walking distance of the Target Center and area hotels. All UND alumni, family and friends are invited to this free event with cash bars, a full restaurant, DJs and more! The Pourhouse invites all UND fans back to the venue after each hockey game. The usual cover charge will be FREE to UND fans or anyone with a game ticket. On-site and nearby parking are available. We hope to see you this weekend as we flood the streets of Minneapolis in UND Kelly green! Is this the NCHC Playoff Champion's Trophy? 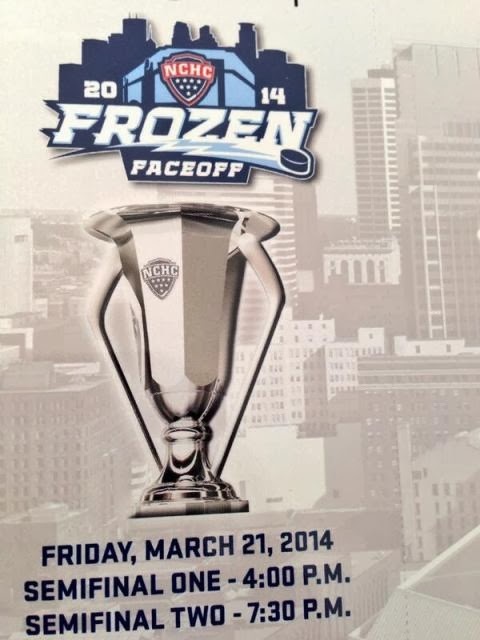 Apparently, this is picture on the tickets that fans are getting for the Frozen Face-off. Kind of looks like trophy a team might be awarded for winning the NCHC playoff championship. One of the concerns for the NCHC going forward is the Target Center being a basketball facility, and that the ice has been poor in the Target center in the past. Well, it looks like the NCHC leadership is cognisant of these concerns and appears to working on this. Bruce Ciskie, the radio voice of UMD Bulldogs, interview Jim Scherr Commissioner of the NCHC. "The arena and their leadership has been fantastic in working with us. As everyone knows, they haven't traditionally hosted a lot of hockey events. We're working very close with them and their operations staff on making sure that all the equipment is upgraded, and the quality of ice, and the quality of the venue, and everything that goes into it to making sure it's an incredible experience for our teams and is on par with the very best in the country. "So we're working very diligently with Target Center on that, and they've been great to work with. That's number one, making sure for the teams that the locker rooms and the ice and the ice access and conditions for play are great. "Second, is we want to fill the house. We want to make sure that our teams are playing in front of a strong crowd. The XCel Center and the WCHA and the Final Five have done great, and we'll have some strong competition every other year from the Big Ten. Filling the house is a big priority, so we're working with them on the right promotions for the tournament." What do you make out this? I like many were under the impression that these upgrades were going to take place and were to start soon. I will be interesting to see how this plays out. The NCHC conference tourney is supposed to be in the Target Center starting in 2014. Joan Niesen, Fox Sports --- The real reason for Stern's visit is to meet Thursday with Minneapolis Mayor R.T. Rybak about the proposed renovations to the Target Center, which were part of the Minnesota Vikings' stadium bill but have been held up in recent months due to financial concerns. Stern was open with his opinion that the Target Center has fallen behind much of the rest of the league's facilities and that something needs to be done about the state of the arena. He sees those improvements as going hand-in-hand with the team's long-term viability in Minnesota. In addition, Stern said that there's no sense undergoing a refurbishment unless the plan includes a pledge to continue to maintain the arena. He compared what he'd like to see done with that of the renovations to Detroit's Palace at Auburn Hills, which opened in 1988, and Phoenix's U.S. Airways Center, which opened in 1992. Both arenas have been renovated and kept current throughout their existence, unlike the Target Center, which opened in 1990. First off, we all know that there is always going to be a lot of hate going the NCHC's way. That's a fact - some take it further than others. No mater what happens to the NCHC the league is always going to have it's detractors. Checking the calender, the NCHC or the B1G have yet to play a single hockey game - so neither league would need to have a web page yet. I would be willing to bet that most of the NCHC fans don't care if the NCHC had a webpage and let it lapse either. I personally am happy that we don't have anyone running the league named Shepherd or McLeod. Of course we have the fans that exclaim that the NCHC is going down the tubes because they let their web page lapse. As far as I know the NCHC hasn't hired a media relations person yet - most of the press releases are coming out of Denver University. I guess we could start the, oh my God the Big Ten Conference doesn't have a web link for Men Ice Hockey. How can that be? They must be poorly run. Why should we care if the NCHC doesn't have a web page yet? First off, it's true if you click on the link for the NCHC there will "not" be a web page for the NCHC. Second, can someone give me the link to the B1G hockey page.... [Crickets Chirping] So it’s one year plus before the NCHC kicks off – someone who hates everything that is the NCHC hockey – seems to think it’s important that the NCHC has a webpage/home page. Really! Are you kidding me? First off webpages don’t make a hockey conference that hasn’t even begun play yet. Also, don't believe the hype by some of the self appointed experts that say that the NCHC doesn't have any name recognition and or appeal... The NCHC is going to be a power conference whether some want to acknowledge it or not. Is the NCHC lacking name-recognition? Chris Peters of the United States of Hockey has this little blurb on his blog today – it’s worth a look. I sure there will be NCHC fans will take issue with some of the things that he said. Or not! In all honesty, the league didn’t have to do terribly much to seemingly come out ahead on realignment. By just letting things play out and adding Notre Dame, largely due to the league thanks to the National Collegiate Hockey Conference’s (seriously, that’s as hard to type as it is to say) lack of foresight and possibly arrogance, Hockey East took another significant step forward by attracting UConn. Meanwhile the NCHC has very little name-recognition, and therefore a second-rate TV deal, a second-rate tournament venue, but a high level of on-ice competition. From a hockey standpoint, it’s a fantastic league, but that’s where it ends. That might be enough for you as a fan, but it’s not enough to lead me or anyone else to believe it’s going to be a great business long term. The Big Ten Hockey Conference will have good exposure on the Big Ten Network, but it’s still merely a six-team league. Until a few more Big Ten schools step up for hockey, and there’s nothing to indicate that will happen anytime soon, the conference’s size doesn’t make for a lot of variety and excitement, though the rivalries should remain intense. Still, the exposure and brand recognition resonates with the casual fan. First off, is Chris Right? For disclosure – Chris was not a big fan of the re-alignment that took place last summer, he isn’t alone there are a lot of people that weren’t fans of last summer's re-alignment plan as well. It's not like we had a choice in the matter, said schools pursued this venture without any input from the fans. That being said, do you agree with what he said? 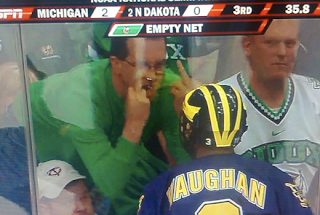 Right now, I am more concerned with what NCHC fans think than the B1G fans. 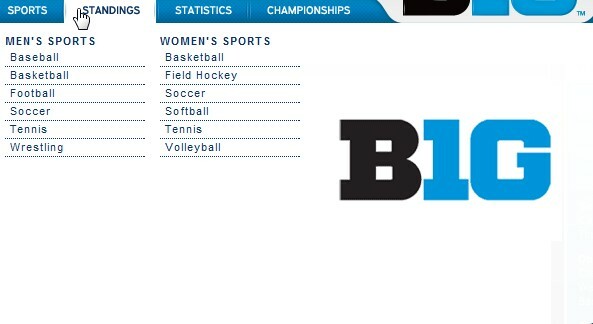 It's obvious that the B1G has name-recognition. Does the new NCHC has very little name-recognition? In my opinion; no! I am also not so sure how you can say that there is little name recognition with the teams that make up the NCHC. Teams like UND, DU, C.C. UMD have all won NCAA titles and have storied histories. Add to the mix up and coming teams like Miami University and Western Michigan from the soon to be defunct CCHA and UNO and SCSU and you have the making of a very well balanced hockey league. The NCHC brings to the table 16 NCAA titles, only the B1G will have more NCAA titles (20), so were not talking about a second rate bunch of pathetic cupcakes here. We already know the title counts of all three leagues involved. Let's take a look at the financials. Historically, the NCHC teams have been successful on the ice as well as financially; if you look you will see that five of the future NCHC teams make about 3.2 million off of their Division I hockey programs as opposed to the reconfigured Hockey East which loses about $395,000 a year of their hockey programs. Only Denver and Western Michigan have lost money with their hockey programs. I am not here to disrespect Hockey East or (Chris for that matter) because Hockey East is a very good hockey league and has piled up an impressive four NCAA titles during the 2000’s, however, it’s only been two teams that have won the NCAA titles during that time period ( BU and B.C.) – besides the three power schools currently in the Hockey East no other really stands out in that conference, except maybe the University of New Hampshire. If anything I think that the two leagues are on equal footing as far as name recognition goes in college hockey. I think historically speaking people are just as familiar with BU and B.C. as they are with DU, UND when it comes to college hockey. Adding Notre Dame to the Hockey East was a good move but what exactly have they accomplished during their hockey existence? Yep! You will be able to watch your team play Notre Dame when they play their Hockey East foes, but the rest of the league is not going to benefit financially from that television deal. Breaking it down further – outside of the power schools Boston College, Boston University, Maine and UNH who else in the current Hockey East stands out and packs fans in the stands? Maybe Notre Dame when they get to Hockey East in 2013-14. Are University of Connecticut hockey fans going to suddenly realize that they have a college hockey team and fill the XL center when it’s 30 miles from their campus? This isn’t the UCONN Men’s or Women’s Basketball teams. This is a very different animal, the UCONN Huskies hockey team with very little history that is currently a member of the AHA conference, that’s not to say that they can’t evolve into a power house hockey team. Let’s call UCONN a work in progress. Here is the part that I do agree with Chris with. If the Target Center which is exclusively a Basketball venue doesn’t improve after the 100-150 million dollars improvements Target Center is going to be a second rate tournament venue. That’s really not debatable; the Target Center has its work cut out for it. The central location of the Target Center does make it an attractive venue and the majority of the fans that have the most rabid fan bases are all driving distance away. Finally, I am not so sure we can call the deal with CBS Sports a second-rate TV deal, before we even see how it turns out. Besides the Notre Dame TV deal with NBC Sports Net, how is the rest of Hockey East doing when it comes to games being televised? I have watched a few of the games on NESN via my DirecTV Satellite Dish but I don’t see a lot of UMASS Lowell or Amherst games on the dish. There are a lot of unknowns going forward – no one knows how this deal is going to shake out – I would say at least give the NCHC a chance before we bury them and kick dirt on a conference that hasn’t even played a collegiate hockey game as of yet. I also think that it’s too early to declare winners and losers – with college athletics none of this stuff stays static – things change constantly. Who knows, maybe there are more moves in the re-alignment phase before the 2013-14 season kicks off. Lastly, I know there are a lot of unhappy people with the NCHC Television deal, I gathered this by reading the reactions of the fans over on Brad Schlossman’s blog. Due to the size of UND’s fan base there are a lot of fans that live outside of the Midco.net foot print and watch UND hockey on DirecTV or FTA Satellite dishes. After the upcoming season, many of them are worried that they will no longer be able to watch all of UND’s home games. I too wonder if I need to re-subscribe to Midco.net myself? In conclusion, there is also no reason to panic just yet because there is a whole year left to work out the details. As we get closer to the kickoff of the NCHC more details will emerge and we will get a better idea what is going to transpire. I also don't think that the NCHC will lack name-recognition. Wait, what? Do you really want to go there? I am not sure why the guy that has the TYT blog wants to start a fight with the North Dakota Fighting Sioux fan base? I am sure that most of you have probably never seen it because no one reads his blog any ways. Then again, I suppose if you want to generate interest and hits and lot of traffic to your blog – infuriating one of the more passionate fan bases in all of college hockey probably doesn’t hurt – it will bring more traffic to your blog. I'm. So. Pumped. And no, it has nothing to do with my opinion of Native American mascots, the NCAA's rule on them or the larger social and political issues involved. I just hate North Dakota, so things that make them sad make me happy, simple as that. All of that said, this is The Story That Will Never Die (TM), so I'm not throwing the party until what's apparently a minority of the state's residents are unsuccessful in their next avenue of appeal, an attempt at a constitutional amendment. Apparently Dean Blais' comments about the selection of the Target Center has also gotten ire of the TYT blog as well. Two can play at that game, Deano. If North Dakota's out of the NCHC tournament, you're left with a choice of: a) two branch campuses, b) two MAC schools (and I love the MAC as a current student at a member school), c) two schools 900+ miles away and d) St. Cloud State in e) a facility that's almost universally seen as second-rate for hockey compared to the Big Ten's Xcel Energy Center. So good luck with that. The Big Ten, without Minnesota, still offers three all-time top ten men's hockey programs and five schools with universal brand recognition. And (including Minnesota again) the main campuses of two NCHC schools, although Nebraska doesn't sponsor hockey yet. Actually, it is worth pointing out that the Big Ten's entire tournament will be played in St. Paul (or Detroit, in alternating years). In other words, Minnesota will have at least one game at the Xcel Energy Center every single year. North Dakota, on the other hand, will have to get through a best-of-three campus site first round to make it to Minny. They probably will most of the time, but hey, no guarantees when you've recruited the eight best hockey programs in the country into one conference. While the TYT is half right – the games that UMN plays in are going to be the highest attended games of the B1G tourney – that’s a no brainer – the problem is that other games will not be as highly attended as the days of the old WCHA tourney. That’s reality! No longer will you have SCSU, UND, UMD fans coming to the games at the Xcel energy center. The aforementioned teams will be replaced by PSU, OSU, MSU and Michigan. OSU hockey fans don’t attend games in their own building what makes you think that they are going to attend games in Minnesota or Detroit for that matter? Thge lingering question is – are Michigan and Michigan State fans going to attend the B1G tourney in St. Paul every other season? Here is the attendance numbers of the last two games that Michigan was involved in during last season’s CCHA tourney 10,421 (Michigan vs. WMU) and 7823 (BGSU vs. Michigan). If Michigan isn’t going to stuff the Joe Louis arena full of their fans when they are playing what makes people think that Michigan and Michgan State are going to travel to St. Paul when they are only guaranteed only one game? Going forward It will be interesting to see how many people actually attend the B1G, NCHC and WCHA conference tourneys. To the person that suggested that OSU and Michigan State being a big draw I wouldn't count on it - here are the OSU numbers for the last two season. One of the “major” concerns for NCHC fans about the conference signing a five year deal with the Target Center in Minneapolis for the NCHC tourney has been ice conditions – historically the Target Center has had the propensity to have very bad ice – which is a buzz kill in hockey. You can't skate on slush very well. More specifically the WCHA held the Final Five at the Target Center during the 1998-99 and 1999-00 seasons and the ice condition was really poor, also there are some bad sight lines as well for hockey because the Target Center is a basketball only arena for the most part – hockey is not played on a regular basis at the Target Center. Eric Stromgren/CHN Writer --- The Target Center has been criticized as a hockey venue from ice quality to fan sight lines, something officials addressed in the press conference and with the media afterword. Scherr said there have been "very specific discussions" on ice quality. Mattson has worked at the Target Center since the building opened and said past problems could be attributed to quick turnaround times required from the staff. Ice before the state high school tournaments in 1999 and 2000 were put in a few days before the tournament, Mattson recalled. "We know we've got to get it made earlier, give it a proper amount of time to get it ready, get it skated on and get it roughed up — that's a challenge we're up for," Mattson said. Mattson said ice will likely be made in mid-February to avoid potential problems and the Timberwolves would play above the ice with the court placed on a "deck." I have seen it mentioned in a couple of newspapers that the NCHC has a opt out clause with the Target Center if the conference is not happy with the Target Center but I have yet to see it mentioned in the latest press releases that I have received from the NCHC. MINNEAPOLIS, MN, June 11, 2012 -- The National Collegiate Hockey Conference will conduct its NCAA Division I men’s ice hockey championship tournament at Target Center in Minneapolis beginning in 2014 to conclude its inaugural season. NCHC Commissioner Jim Scherr and Target Center Vice President and General Manager Steve Mattson were joined by Minneapolis Mayor R.T. Rybak in making the announcement today of a five-year agreement at a news conference at the arena. The winners of the conference quarterfinals, which will be played on the home ice of the top four regular-season finishers in the eight-team league, will qualify to come to Minneapolis for the NCHC Championship at Target Center. CBS Sports Network, the Conference’s national television partner, will televise the tournament’s two semifinal games and the championship game. A third-place game also will be played at Target Center. The dates and times for the games of the NCHC Championship at Target Center will be announced at a later date. The agreement between the NCHC and Target Center is the second major announcement in the last month for Minnesota’s preeminent sports and entertainment arena, following news that the home of the NBA’s Timberwolves and WNBA’s 2011 World Champion Lynx will undergo a multi-million dollar renovation over the next several years. During its 21-year history, Target Center has hosted an array of outstanding ice hockey events, including National Hockey League regular-season and pre-season games, International Hockey League games, four University of Minnesota “Border Battle” showdowns against Wisconsin, WCHA Final Five tournaments, Minnesota State High School tournaments, and United States Olympic Team exhibition games. Located in the heart of downtown Minneapolis’ vibrant Warehouse District and adjacent to Target Field, Target Center opened its doors in 1990 and is best known as the home of the NBA’s Minnesota Timberwolves and the WNBA’s Minnesota Lynx. The arena, owned by the City of Minneapolis and operated by AEG, attracts more than 1 million visitors a year thanks to its professional basketball teams, sporting events such as college and high school hockey and high school basketball and entertainment events including major concerts, family shows and other attractions. The National Collegiate Hockey Conference is the eight-school, Division I men’s hockey conference that will start play in the 2013-14 season. 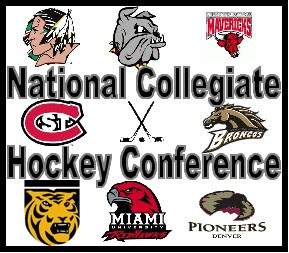 The NCHC’s member institutions are: Colorado College, University of Denver, Miami University, University of Minnesota Duluth, University of Nebraska Omaha, University of North Dakota, St. Cloud State University and Western Michigan University. Since 2000, the National Collegiate Hockey Conference has produced four NCAA Champions, 14 NCAA Frozen Four appearances, 12 conference regular-season championships and 12 conference tournament championships. All eight members have been participants in the NCAA Ice Hockey Championship tournament at least once since 2010, including five teams in 2012. CBS Sports Network (CBSSN) is the 24-hour cable destination of CBS Sports. The Network covers more than 340 live games annually, showcasing 30 men’s and women’s sports, in addition to a variety of studio shows, documentaries and original programs. CBSSN’s live programming is highlighted by college sports including teams from the Mountain West, Conference USA, Atlantic 10, Patriot League, the United States Naval Academy and the United States Military Academy, as well as Major League Lacrosse, National Lacrosse League and the Lucas Oil Off Road Racing series. CBSSN’s daily programming includes ROME hosted by veteran sports personality Jim Rome and the Tim Brando Show. The Network also is the home of Professional Bull Riders (PBR). CBS Sports Network is available across the country through local cable, video and telco providers including Verizon FiOS Channel 94 and AT&T U-Verse Channel 643 (1643 in HD) and via satellite on DirecTV Channel 613 and Dish Network Channel 158. For more information, including a full programming schedule and how to get CBS Sports Network, go to www.cbssportsnetwork.com. I had been rumored that the NCHC conference tourney was going to be be held at the Target Center, the official announcement is coming soon - as early as Monday. I know there are a lot of fans that aren't excited about this move nor is the Target Center a very attractive choice for a "college hockey" conference tourney. There are some positives to look at - while the Target Center is a building built for basketball and hockey is kind of an after thought for the Target Center - there will be 100-150 million dollar renovations to the facility very soon. The positive aspect about the Target Center is that UND, SCSU, UMD and UNO are all within close driving distances and will be the four schools that the majority of the attendance will come from, so it makes sense as a centralized location. Is the NCHC close to picking the Target Center for their Conference tourney? Twitter has been alive this afternoon with the news that the NCHC has picked Joe Novak as hockey operations director – we also found out that the NCHC is close to selecting a venue for the conference tourney. It has been rumored for some time now, that the Target Center was in the mix as a possible venue for the NCHC tourney – it’s sounds like that rumor is even closer to becoming a reality. This is the tweet that seemed to set the twitterverse on fire this morning; UND Fighting Sioux beat writer Brad Elliott Schlossman of the Grand Forks Herald's posted this little nugget on line. As we saw from the 2011 WCHA Final Five, UND and UMD fans filled the Xcel Energy Center when Wisconsin and Minnesota were knocked out in the first round. Jess Myers of 1500 ESPN and of Inside College Hockey has this little nugget in his post on Thursday and my first reaction is no thank you. The Target Center is less than attractive option for hockey and the ice was horrible last time a hockey game was played in there. Jess Myers 1500 ESPN --- And what about those armies of North Dakota fans, with their team heading to the new NCHC (with Minnesota Duluth and St. Cloud State) at the end of next season? For now, it looks as though they could be heading to Minneapolis, as NCHC officials have reportedly been offered a sweetheart deal to hold their post-season tournament at Target Center. Of course, that idea raises several questions about the future. The initial good news that there would be one or two college post-season tournaments in the Twin Cities every March is tempered just a bit by several "yes, but..." factors to consider. For example, while a Minnesota-Michigan tournament final in St. Paul in St. Paul would surely be a sought-after ticket, the notion of filling Xcel Energy Center for a match-up between "new" WCHA teams like Michigan Tech and Bowling Green has no basis in reality. A title game featuring Bemidji State or Minnesota State, Mankato might draw a respectable crowd, but in most years where the Gophers are at Joe Louis, there will be oceans of good seats available. And the inadequacy of Target Center as a hockey building is one of the reasons the North Stars headed to Dallas rather than moving from the antiquated Met Center to downtown Minneapolis in 1993. A 2010 game between the Gophers and the Badgers is the only hockey game the building has hosted in more than a decade. Personally, I like the option of rotating the tourney between Denver, Colorado Saint Paul, Minnesota and or Omaha, Nebraska. Seriously, unless the Target Center is going to upgrade it's hockey capabilities, more specifically, the ice making capabilities would have to improve quite a bit. That being said, there are better restaurants and bar options in the Target Center area, than around the Xcel Energy Center.